Anthony Gaines dribbles the ball. The sophomore guard scored 11 points in the Wildcats’ last game against Utah. After losing on a buzzer beater to Georgia Tech last November, Northwestern will look for vengeance in this year’s ACC-Big Ten Challenge on Wednesday. After winning two games at the Wooden Legacy Tournament this past weekend, the Wildcats (5-1) are preparing for their first high-profile matchup of the year against the Yellow Jackets (4-1). Despite playing Georgia Tech just a year ago, the Yellow Jackets’ roster has had a lot of turnover since the last time NU saw them. Three of their top four scorers from last season either graduated or declared for the NBA Draft and went pro. The only remaining scorer who scored double-digits last year was sophomore guard Jose Alvarado. Despite those losses, the Yellow Jackets, through four games, have had a better offense than last season, increasing their scoring from 65.7 to 71.4 points per game, while shooting 43.5 percent from the field. Georgia Tech’s offense is a balanced attack, as 12 of its 16 players have scored this season. Along with Alvarado, they are led by graduate guard Brandon Alston, who leads the team with 13.0 points per game. 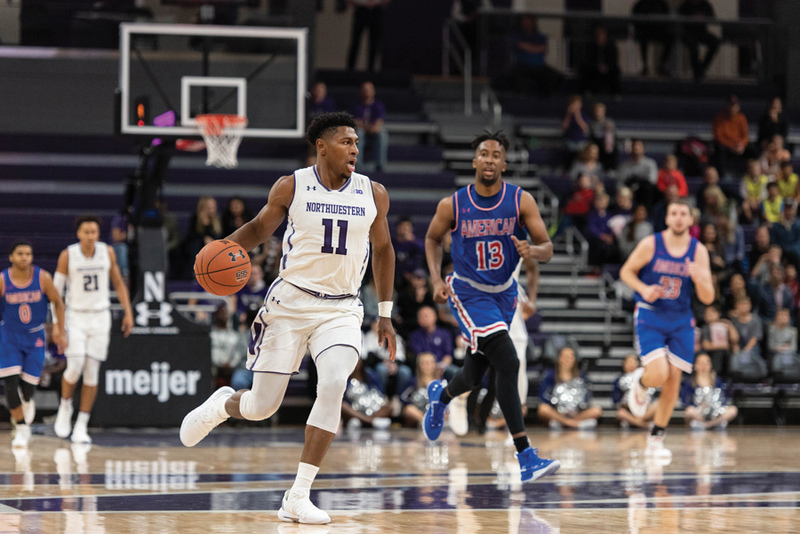 In order for NU to come out victorious, the Cats will have to stick to their strength, which coach Chris Collins said is playing tight defense. In four of the Cats six games this season, NU has held its opponent to under 60 points. In their lone defeat against Fresno State, the Cats gave up 78 points, allowed the Bulldogs to shoot 50 percent from the field and had a season-low three steals to go along with a dismal two blocks. One of the vital parts to NU’s defense so far this season has been sophomore guard Anthony Gaines. The 6-foot-4 guard has been a huge spark off the bench in Collins’ rotation so far this season, ranking second on the team with six blocks and fourth in steals with four. In addition, he added 11 points in the Wildcats’ last game against Utah. Coach Collins said he has enjoyed what Gaines has brought from not only an energy perspective, but a skill perspective. The Wildcats has also seen contributions from their elderly teammates — Jordan Ash, Vic Law, Pardon and Ryan Taylor — defensively. The four seniors have combined to swipe 19 of NU’s 37 steals and swat 12 of the Wildcats’ 23 blocks. If NU wants a different result from a year ago, it will have to rely on that defense that has held its opponents to 61 points per game all season and look to its seniors to produce not only on the defensive end, but on the other side of the ball as well. Law, Pardon and Taylor have combined scored 43.8 points a game this season and Law, in his first season as the primary option on offense, has increased his scoring from last season by 6.5 points. Every game for the Cats is crucial, especially for the team’s confidence, but this win could go a long way in terms of NCAA Tournament implications.